Re-program service for Lotus Elise's fitted with the Meta M99T2 alarm system. If the codecard is lost or the fobs do not function we offer a re-program service. Send in your old alarm for re-programming. All re-programmed M99 brains for Lotus cars are supplied with two coded M300 fobs, a new codecard and user instructions. Simply locate the alarm hidden under the dash on the passenger side (see photo), unplug it and send it to us for re-coding. If a replacement M99 is required for the Elise it will not be possible to code it with the existing M36 immobiliser unless the touchkeys are present, Lotus do not pass these touchkeys to their customers. Both the M99 & the M36 will have to be replaced, the M99 is plug & play, the immobiliser will have to be re-wired (instructions supplied). Please contact the office for more information. This service is inclusive of next day return delivery, if you send the alarm to us via Royal mail next day Special delivery you will usually receive the re-programmed alarm back within 48 working hours of sending it. The alarm is located on the passenger (near side) under the top dash cover, see this page for more info. We can only offer exchange items for orders within the UK, for orders outside the UK we can only recode your existing alarm system. 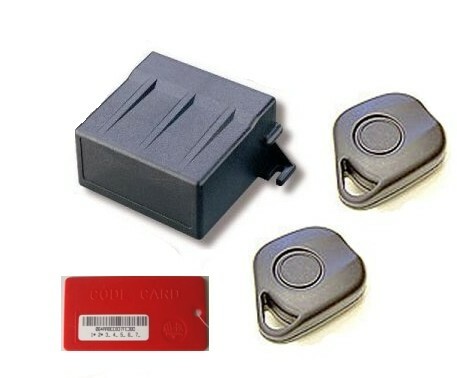 Failure to send the exchanged alarm back will result in a £50 charge, the buyer is responsible for any losses in the mail while returning old alarm brains.